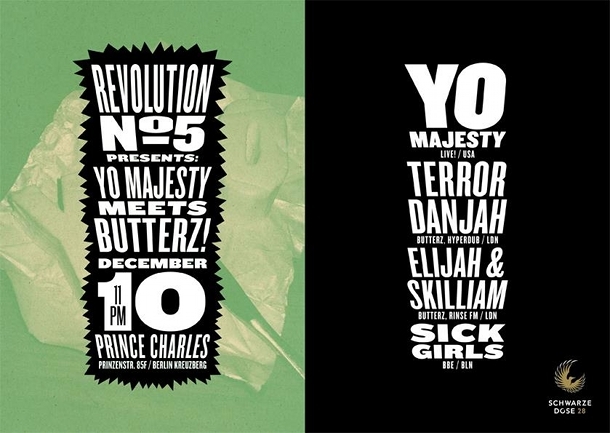 REVOLUTION N°5 presents YO MAJESTY MEETS BUTTERZ! Win 2×2 Tickets! It´s time for a Revolution (N°5) again! The team has again a great line-Up with YO MAJESTY live on stage, TERROR DANJAH (Butterz, Hyperdub/LDN), ELIJAH & SKILLIAM (Butterz, Rinse FM/LDN) and the SICK GIRLS (BBE/BLN)! This time on december 10th at Prince Charles in Kreuzberg! Watch out for a nite of heavy bass!! You have the chance to win 2×2 places on the guestlist!! Comment here on facebook till thursday 23:00 beneath the post.